Pete, Thank you so much for sending me the pics I requested. I'm in the first one. That's my back. Three of my friends and I were in the cemetery that night investigating. My friend, Henry (ghost hunter), has all the equipment and he and my friend Bridget were at one end of the cemetery and Michelle and I were at the other end. That grave illuminated when I walked on it (as you can see in the picture) as I was walking towards this shadow-figure type man I saw. Michelle was taking pictures when I was seeing things. She didn't see anything and was actually scared and grabbing onto my coat. Thanks again for sending me the pictures. 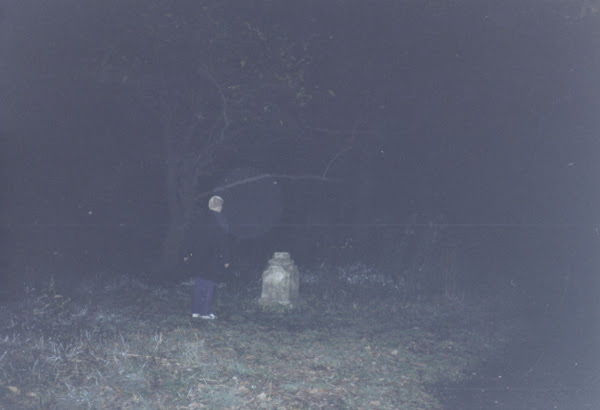 ARCHIVE NOTATION: A light anomaly was photographed when witness approached the area where she witnessed a shadow figure.